I first came to hear of Ancillary Justice through Alex MacFarlane's excellent series on Post-Binary Gender in SF, over at Tor.com - and next thing I knew, all my friends were raving about it. Of course I had to pick it up (that, and everyone was telling me I should - I can take hints :P ). And did it live up to the hype? I'm afraid it's an unequivocal yes, and I'm just going to have to join the queue in recommending it. Shoo, go read the thing already... Oh, you need a little more persuasion? Well, here's the actual review. 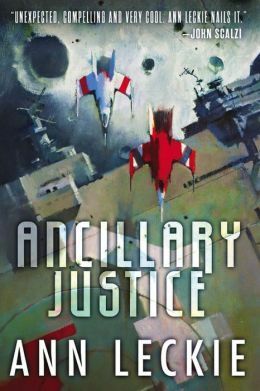 Ancillary Justice is the story of Breq, a soldier once part of a vast, artificial intelligence: the ship Justice of Toren. A military AI in the service of the Radch, a civilisation that conquered a large section of the galaxy, Justice of Toren was betrayed - and now Breq, the last of the ship's bodies, is poised to achieve revenge. But on her way, Breq meets Seivarden, a former (and much disliked) officer of hers, and suddenly things become complicated. Well, more complicated - there's already galactic politics, aliens, conspiracies and a multiplicity of bodies involved. Breq's journey is an interesting one, and uniquely written - both from the perspective of an individual body (Breq, or One Esk), and from the other in the equation: the starship, controlling many such bodies. Leckie manages to pull both off well, with some distinction between the two. As a Radchaai-constructed AI, she's an outsider throughout much of the book, allowing an interesting perspective on the different societies. And that leads us neatly on to the interesting things done with gender... In Radchaai society, gender is not linguistically denoted - only a single pronoun is used, and it's (at least to me) unclear whether the majority of the Radchaai identify as non-gendered (at the very least it's implied that some do, and a welcome disassociation between gender and body implied by one brief explanation of the systems in place for parenting, though this might be me reading too much into it), or whether it's simply considered a private matter. At any rate, our protagonist finds the need to guess gender in the other societies glimpsed difficult. In the narrative, 'she' is used as a default pronoun, which I found rather striking - when 'he' is considered an acceptable default in so much of modern society, and even in other SF novels, it's a useful and rather powerful choice. However, you can read some much better thoughts on it in Alex MacFarlane's post on it here - I agree with her in that using a non-gendered pronoun would better reflect the society, and be more interesting in that respect. At any rate, Ancillary Justice does the matter - well, justice. Sorry. I couldn't resist that one. But Breq's journey isn't undertaken alone, and it's the relationship between her and Seivarden that I particularly enjoyed. It's not a straightforward development, for one thing. Seivarden was an officer on Justice of Toren, and not one the ship particularly liked - so when Justice's last remnant, Breq, runs into her many years later, addicted to kef and in trouble, it's a problematic relationship for both. And the growth in it is all the more impressive and complex for it, and their interactions (at least later on) rarely failed to evoke a smile on my part. It's the kind of odd partnership that more authors could do with taking a closer look at: not just the superficial 'odd pairing' we often see (ie. a robot and a zombie! Together, they fight crime), but the character, views, and backstory of each is fundamentally different, and troubled. Despite my raving over the worldbuilding, I should also say it's done subtly. While there are the mandatory infodumps from time to time, tidbits of Radchaai society are parceled out slowly as they become relevant - and some, either taken for granted by Breq, or irrelevant to her, are barely touched on (and I only hope we get to hear more of life for the normal Radchaai in the sequel - particularly the Aptitudes, a series of tests which seem to determine role and career in the Radch). That said, One Esk versus Justice of Toren's multiplicity of bodies took a little while for me to figure out properly, and if the novel seems to start slowly - well, I would give it a few chapters. However, it's true that the pace is never lightning-fast, and while the latter half of the novel speeds up considerably, be prepared to invest some time first. It's also worth noting that Ancillary Justice is the start of a series - albeit one with a surprising amount of resolution. The ending is remarkably, if not wholly satisfying, fulfilling most of the promises made at the novel's opening, but leaving the main conflict to come (and if it's anything akin to Ancillary Justice, I can't wait for it). ...I've spent a while trying to think of any major flaws. The infodumps have occasionally been clunky, a more gender neutral pronoun seems that it would have better suited Radchaai society (but 'she' was a powerful choice, so I have a hard time being picky)... But really, there isn't much. The prose isn't as beautiful as, say, Kay's, but it's nothing to scorn: it's largely invisible, and handles conveying some quite unfamiliar concepts (protagonists with multiple bodies?) deftly. Overall, Ancillary Justice is a tightly written novel with several intriguing concepts, an engaging plot (and pair - I didn't expect to get on with Seivarden nearly as well as I did), and a sequel hook that'll keep me waiting eagerly for the next. It's a truly wonderful book. I can't help but recommend it. doanh nghiệp my pham lê lương bổng chuyn chế tạo và chế tạo phụ kiện trang diem mat kết hợp mang phân phối các phu kien trang diem thấp nhất trên ả dài có nhiều tác phẩm đa dạng kí nhất trên thị dài. ngoại giả chúng trui còn phân phối ví sỉ lẽ phan nen cũng như phan phu và phan tao khoi tặng nhiều ả dài lớn trên cả nước.